From the trilogy department... 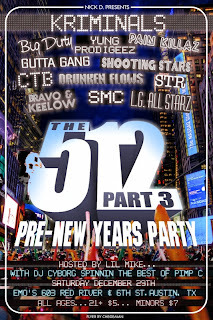 The 512 presented by Nick D and hosted by Lil Mike @ Emo's on Dec 29th featuring all your favorite holiday hit from the Kriminals, Big Dirty, Yung Prodigeez, Pain Killaz, Gutta Gang, Shooting Starz, CTB, Drunken Flows, S.T.R., Bravo & Kee Low, SMC, L.G. All Starz, and DJ Cyborg comin' at ya' the the late and great PIMP C to get you in the holiday mood. Hope everyone had a good Christmas... and in the words of my buddy Ebon... May a fat white man break into your house and leave presents instead of an eviction notice! Peace.